The upcoming Ford GT super car was a closely guarded secret until its stunning reveal at an auto show in Detroit this past Jan. However, Ford will not build this 600-horsepower beast in-house, choosing instead to tap Multimatic, Inc., a Canadian supplier, to assemble it in Ontario. The Ford GT is a 600+ horsepower beast, powered by an enhanced twin-turbo EcoBoost V-6 engine. The super car literally stole the show at the North American International Auto Show in Detroit, and has also stolen the hearts of not a few race car enthusiasts. The GT will go into production in Canada, with privately-held and Toronto-based Multimatic tasked with handling the work. Production of the Ford GT will commence in late 2016 according to a report filed by The Globe & Mail. Joe Henrich, president of the Americas for Ford Motor Company, made the announcement at the Canadian International Auto Show in Toronto late last week, confirming speculation that an outside supplier would, indeed, handle production. 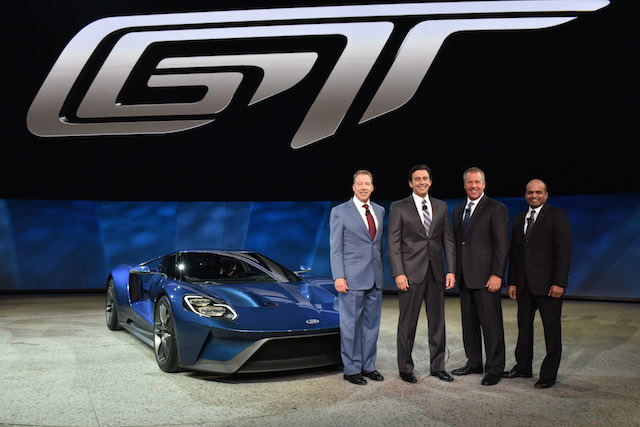 Left to Right: Bill Ford, Mark Fields, Joe Hinrichs and Raj Nair with the new Ford GT. All four men were part of a limited group of people behind the super car’s secretive development. Multimatic and Ford have collaborated for more than 30 years. The privately-held company is the supplier of choice for other companies too, especially renowned performance models, including the Chevrolet Z/28 and Aston Martin. For instance, in cooperation with Chevrolet Performance, the company supplies lightweight Multimatic DSSV dampers for the Z/28 and other Camaro models. Moreover, the company says that its DSSV has been the damper of choice for cars running the 24 Hours of Le Mans. The Ford GT has been receiving well-deserved accolades since its global premier, including garnering the prestigious EyesOn Design Award for best production vehicle at the NAIAS. That award is assigned only to new production vehicles debuting at the Detroit show. Likewise, the Ford GT won “Best of Show” honors in the 2015 Detroit News Reader’s Choice Awards. Ford’s super car expressly demonstrates the company’s innovation as it fuses an ultra-efficient, high-performance engine with advanced light-weighting and aerodynamics to deliver a truly exceptional race car. Furthermore, it also represents just one of at least a dozen new models coming from Ford Performance over the next five years, including specific Mustang and F-150 variants as well as the upcoming Ford Focus RS. Ford’s GT features a mid-mounted twin-turbocharged V-6 engine, with power sent to the rear wheels. It is composed of a lustrous, aerodynamic, two-door coupe body shell. Lightweight materials, including carbon fiber structural elements and aluminum front and rear subframes, will enable outstanding acceleration and handling along with improved overall efficiency. Ford says that the hyper EcoBoost V-6 is “based on the same race-proven engine architecture serving Ford’s IMSA Daytona Prototype endurance racing efforts,” and features a generous power band with remarkable time-to-torque temperament. The GT’s lightweight chassis is an engineering marvel as it is marked by an active racing-style torsion bar and pushrod suspension, with adjustable ride height. The super car’s 20-inch wheels are attired with Michelin Pilot Super Sport Cup 2 tires composed of a special compound and structure engineered particularly for the Ford GT. Its multi-spoke wheels encompass carbon-ceramic brake discs at every corner. Inside, Ford says that the interior has been optimized to ensure control, comfort and safety. Dihedral or upward swinging doors enable access to that cabin, itself marked by an F1-style steering wheel with integrated driver controls. A configurable, digital instrument panel and paddle shifters are among the other highlights of the cockpit. Certainly, the Ford GT will be built in small numbers and its price has not been announced. Still, with the GT mentioned in the same breath as other high-end models — Lamborghini Huracan ($237,250) and McLaren 650S ($265,500) — a quarter of million dollar price tag seems entirely plausible.